Any traveller worth their salt has heard of the Camino – the famous Spanish pilgrimage route running westwards from the Pyrenees to the holy city of Santiago de Compostela. Pilgrims have been walking the 780km path for a thousand years, but in the last few decades the Way of St James has exploded in popularity. Inspired by books like The Pilgrimage by Paulo Coelho, and the Martin Sheen movie The Way, thousands of walkers from all over the world now come to experience the spiritual, mystical and natural atmosphere that pervades this ancient trail. By the start of 2016 the idea had been in my head for some time, too. Desperate to get away from the rat race of London, I dreamed of donning the famous scallop shell and setting off with only backpack and walking stick to sustain me. Something in me yearned for an epic journey, but also a chance to reflect, meditate and meet like-minded travellers. After finally quitting my job, I began to look seriously at preparations for the Spanish Way, or Camino Francés as it’s known to pilgrims. Then something quite strange happened. Out of sheer curiosity instead of tracing the route into Spain, I moved my finger backwards (east) on the map – away from the traditional starting point of St Jean-Pied-de-Port. 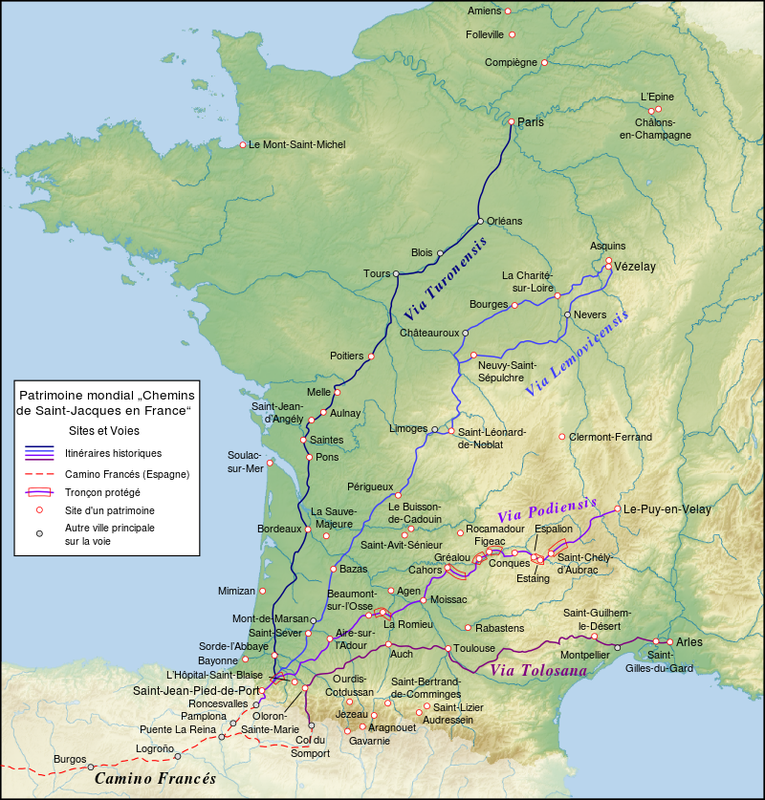 I quickly realised Spain is only the convergence point for the many pilgrim paths that come through its neighbour, France. My eye was drawn to a place called Le Puy-en-Velay, the starting point for what’s called the Via Podiensis pilgrimage route. Further research suggested this particular walk to St. Jean crossed dramatic mountains and forests, picturesque rural valleys, and passed through medieval towns with ancient monasteries. 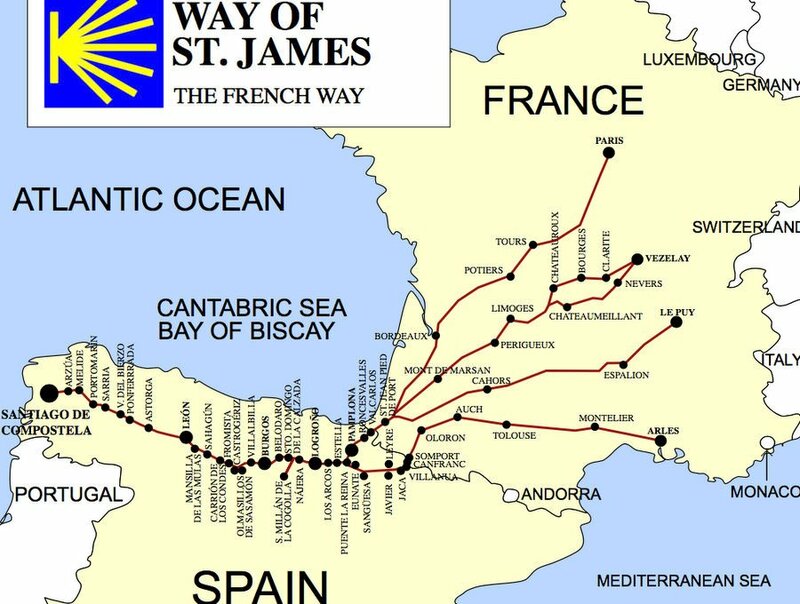 Pretty soon, of course, plans for Spain were shelved, and in May 2016 I set off from Le Puy along this French Way of St James. 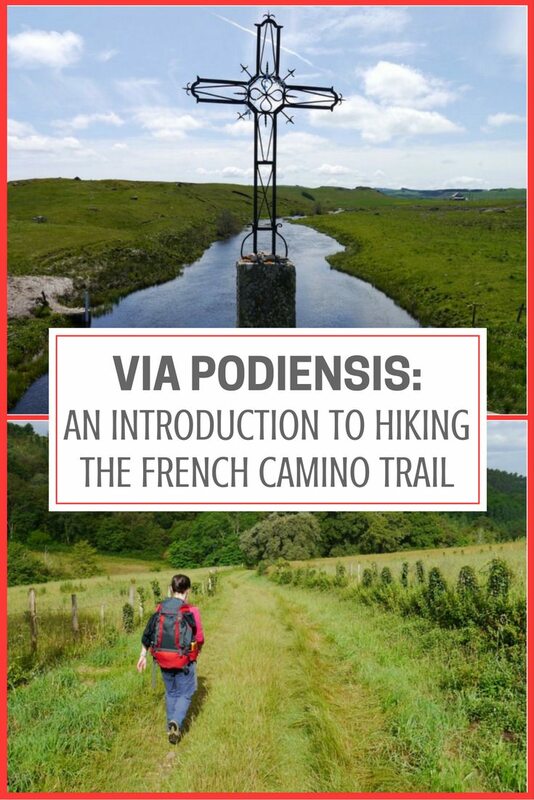 The Via Podiensis, or Chemin du Puy as it’s known in France, has a lot in common with its Spanish counterpart, the Camino Francés. It’s roughly the same length – at 750km, it’s a great distance for about 4-5 weeks on the move. Like in Spain, special walkers’ refuges – called gites – are there for you to use at a low-cost. 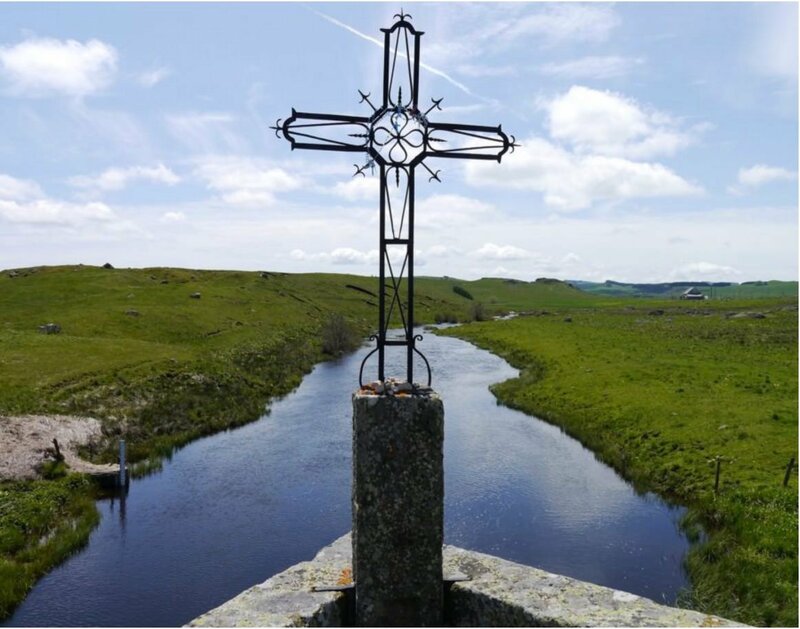 And just like on the Camino, the route passes crumbling pilgrim chapels, soaring medieval cathedrals and hundreds of pilgrim crosses by the roadside. Looking back on my time in France now, it all seems like a dream. Most days I walked entranced, as if floating along the surface of another planet. 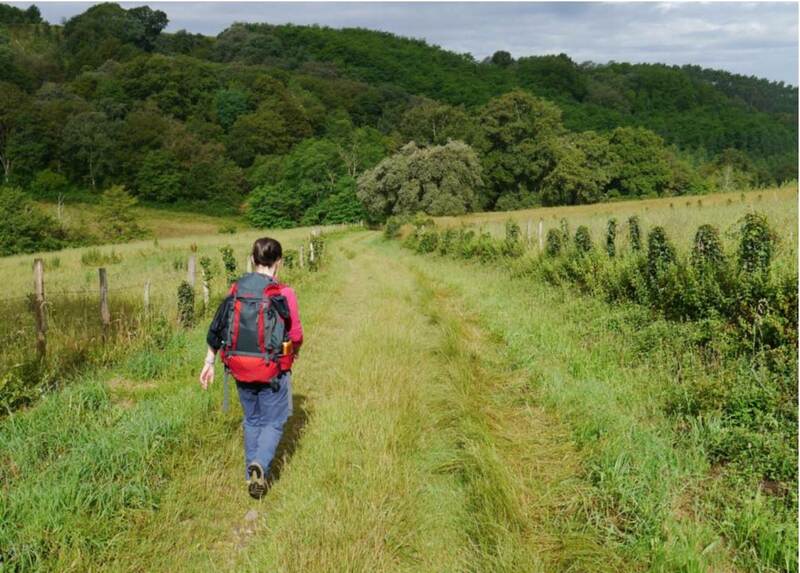 The first week of the walk is certainly the most awe-inspiring – leaving the volcanic landscape of the Haute Loire, you quickly pass into the mountainous drama of the Margeride. Local legend has it a grey wolf – known as the Beast of Gevaudan – ran amok here in the 18th century, killing hundreds of local people. Pictures of ‘La Bête’ are everywhere and add a certain thrill to a pilgrim’s walk down lonely forest trails. Soon the route passes into the Aubrac – a high plateau landscape full of huge broken rock, stone walls and windswept gorse, hugely reminiscent of England’s Yorkshire Dales. 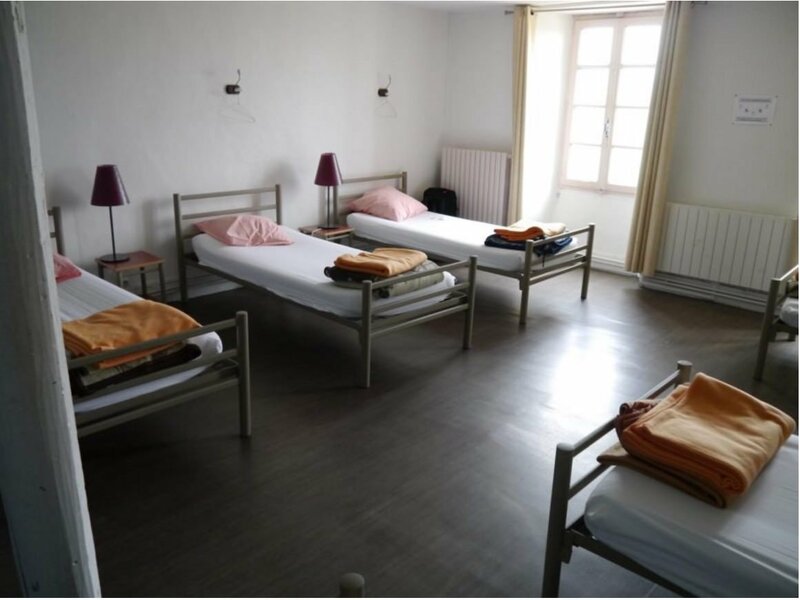 Accommodation might be found at a huge old pilgrim’s place, where for €12 you’ll sleep on an old hospital patient’s bed in a dorm with six other tired walkers. On a single enchanted day I walked through three of the most beautiful medieval towns I’ve ever seen – St Côme d’Olt, Espalion and Estaing. Many of these places are UNESCO-rated and have their medieval cores completely intact. 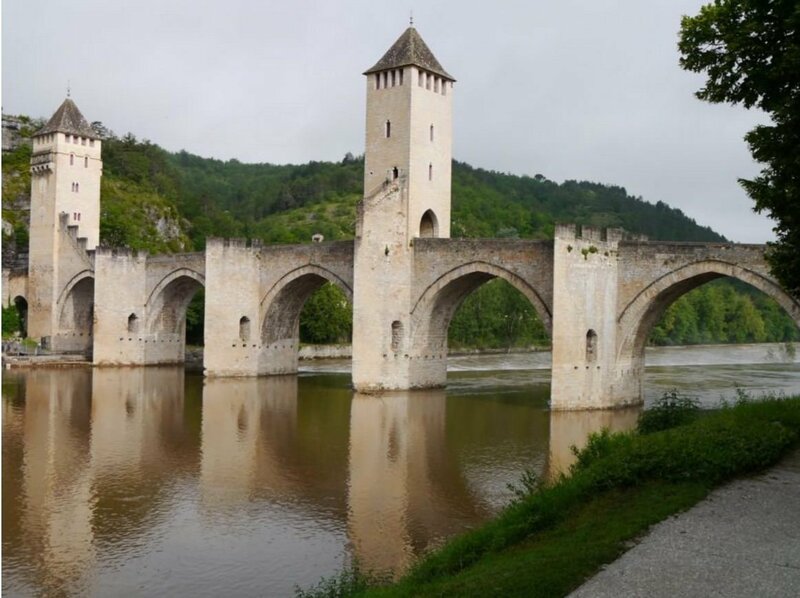 The Via Podiensis eventually comes down from the heights, winding its way south-west over the magnificent Pont Valentré medieval bridge at Cahors, and through the wonders of Figeac and Moissac. The landscape changes to the stuff of Grimm’s Fairy Tales – winding forest tracks, rolling countryside, medieval towers and waving fields of golden wheat. Many a tear is shed at the first sight of the Pyrenees as you pass into the Basque Country. Such dazzling natural riches are part of the pilgrim experience, but many more come from another source: your fellow wayfarers. Unlike the predominantly ‘young’ vibe to be found on the Camino in Spain, the demographic on the Le Puy route is slightly older. Being less well-known, the walk tends to attract a lot of older or retired French groups. I had some incredible evenings with very many kind, wise and hilarious French retirees. In France an emphasis is put on dining together in the evenings at your gite. Perfect strangers become firm friends as you laugh, tell anecdotes and gorge your huge appetite on the local food and wine. Helping one another out is an unsaid code on the pilgrimage – incredible kindnesses and gifts are extended. I had meals paid for, accommodation covered, medicine and clothing given to me – all completely sourced from a magical fountain of pilgrim goodwill. On the trail there’s an honesty to be found unlike anything you’ll witness in your normal daily grind. The undertaking is a hard one – walking 19 -28 kilometers, day after day for 4-5 weeks causes people to stick together and draw the best out of each other. Pilgrims walk for many reasons. Some, like me, to see the incredible landscape and reflect a while. Others walk in the shadow of great loss, or change. You may find it’s your task for the day to spend a few hours beside your fellow man (or woman) reassuring, discussing or simply sharing in the marvel of being right here, right now – alive together amidst all this natural beauty. The meaning of your walk gathers strength with every step taken, every village visited, every conversation shared. The whole thing can’t help but be mystical, allegorical – answers to long-held questions come to a pilgrim in quiet places, or amidst the laughter around the evening dinner table. It’s all rather stunning and completely unforgettable. Soon you come to an inevitable conclusion: long distance walking is the best way to press pause on ‘normal’ life, to get reacquainted with yourself and rest your soul a while. But what about the costs of walking the Camino in France? Many are drawn to the Spanish Camino because it can be done so cheaply. There you can find albergues – or hostels – for as cheap as €7-8 a night, with food only another €10-15 more. A month on the Camino in Spain can easily be done on a budget of €800-1000. People tend to think a similar experience in France would cost a huge amount more. In fact, this isn’t true. Accommodation costs are higher than Spain, but not by much. On my walk I managed an average of only €16 per day for my bed, and another €12-15 for food and other costs. My total budget for the walk – not including flights or insurance – came to €1100, or just over €30 a day. I’d challenge anyone to see so much of gorgeous, magical France on a budget smaller than that. As I said, reasonably priced walkers’ accommodation is available all along the Via Podiensis route – there’s rarely a stretch of 5-10km without some advertisement for a gite. Municipal places are a good cheap option, usually costing €10-12 a night, and with cooking facilities so you can make your own dinner and breakfast. 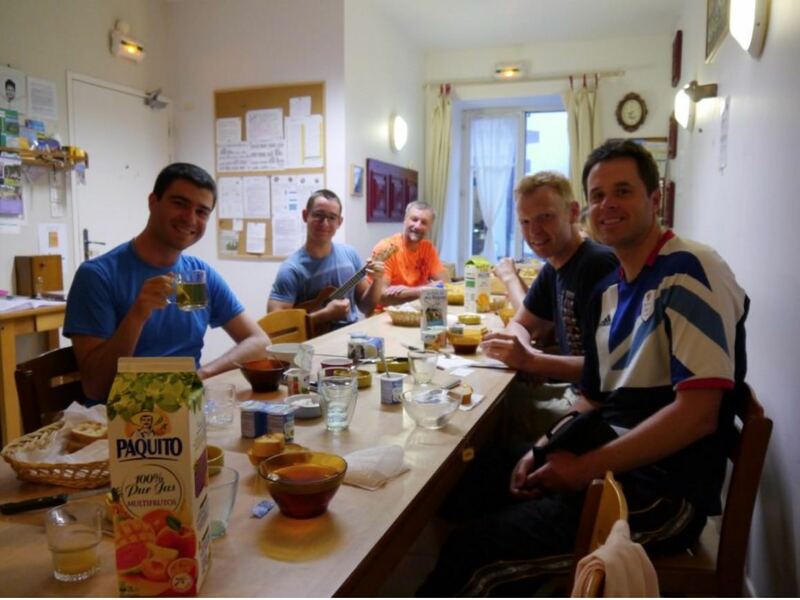 Often though, you’ll get offered demi-pension in a gite, where along with the bed in a simple dorm-style room you’ll get a superb dinner and breakfast before you go. This costs a little more, but is definitely worth doing once in a while. After all, you’re in France – you’ve got to enjoy the food, wine and hospitality! As for me, I’m now firmly addicted to long-distance walking. 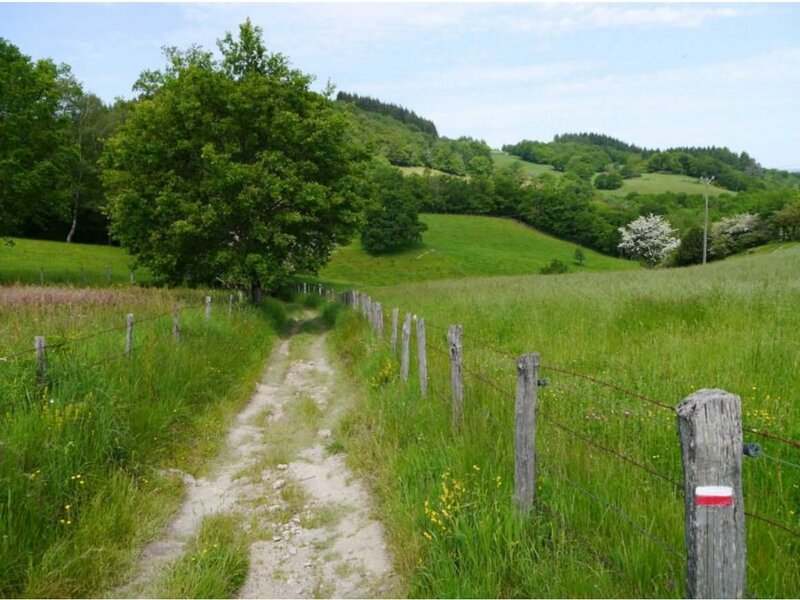 I plan to take on the Via Tolosana at some point – another variant of the Camino, this time in the south of France. I’d dearly love to attempt the Pacific Crest Trail as well, but for now I’ll stick with my native England – here we have some of the best walking anywhere in the world. Pilgrim, I wish you buen camino, or as they say in France, bon chemin! 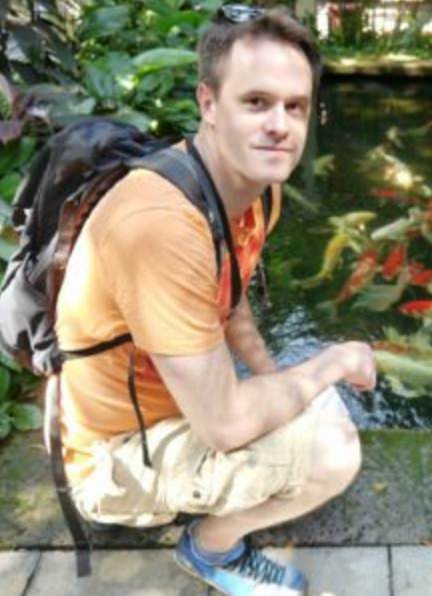 Tom Caley runs IndieLifestyle.net, a site devoted to travel, fitness and personal growth. His favourite past times include push-ups, long days in the mountains and reviewing books about heroes. You can find him on Twitter, Facebook and YouTube. Sounds like a great way to see France at a human pace … great post! Great post! I have a friend who just did the camino last year and came back with such incredible stories. We would love to do this trek! 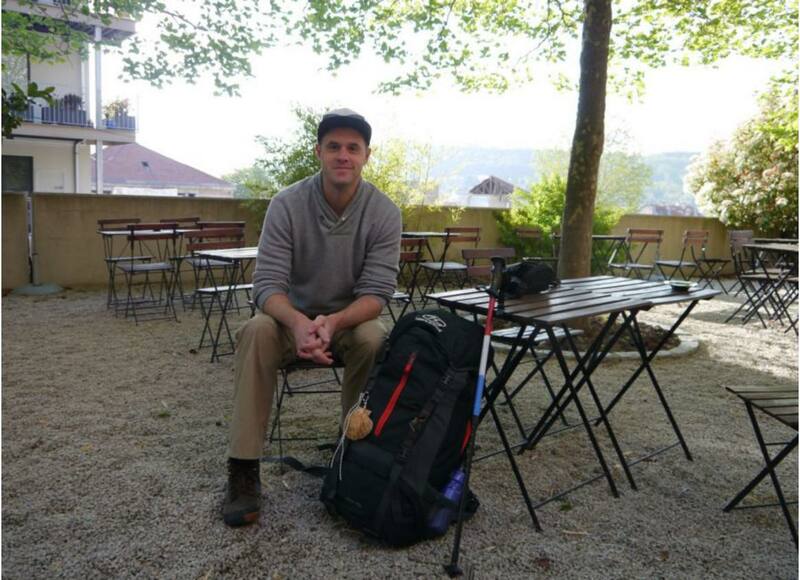 I completed my Camino Frances from St John Pied de Port to Santiago 3 weeks ago. I walked for 42 days (I’m 73 years young) and it was perhaps the best thing I have done in my life! I certainly agree with Tom’s comments relating to unexpected friendships, random acts of kindness and thought provoking moments whilst walking in solitude; to say nothing of experiencing unique cultural and geographic phenomena without the usual tourism industry hype. When on holidays I always commence thinking about where I might travel next and so I’m researching the Via Podiensis for 2018. Thank you Tom; just what I’ve been looking for! 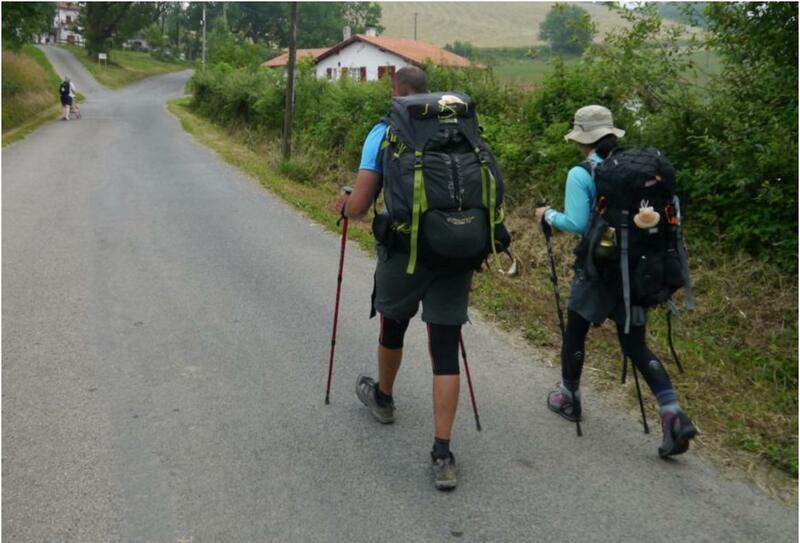 My wife and I have walked from St Jean to Santiago and Porto to Santiago. We to walk from Le Puy to St Jean and maybe continue on again to Santiago within the next few years. Definitely good for the soul and a great body tune up despite the wear and tear on the feet. Cheers! I’m waiting for the stars to line up, then I’ll be in Le Puy to walk my third Camino. I’m hoping that will be this fall. I have the guidebook, I can be packed in an hour. Have you since walked the Camino Francais? I have a friend who just did the Camino last year and came back with such incredible stories. It looks like such a fantastic trip!